It’s been quite a while since I’ve explored some juicy celebrity tabloids as of lately. So, because I’m procrastinating hard, I figured it was the perfect time to check out the ever so fabulous PerezHilton.com. For old times’ sake! I totally forgot how ridiculous and hilarious some of the headlines are. Here are a few of my favourites that I’ll share with you beauties..
I’m still baffled that they’re even together after all this time. Wasn’t it just for ratings?! LIKE, HI..the twilight “saga” is long over friends and so are you two. Kristen Stewart is actually the most awkward human being on this planet (And that’s coming from one hell of an awkward individual myself). I bet when he breaks up with her she’ll just stand there with that super uncomfortable blank expression on her face. Grow up. This is the number one reason why J.Law and I would be best friends in real life…we’re basically the same person! She eats pizza, I eat pizza. She likes wings, I like wings. If people didn’t fall in love with her when she tripped going up the stairs to accept her Oscar award, they HAVE TO love her now! So relatable, am I right girls?! You know what they say right? All good things must come to an end =( This hot dad is officially retiring from soccer (I don’t blame him, if I were that beautiful, I wouldn’t want soccer balls, limbs and cleats flying around my gorgeous face either, hubba hubba!). At least now you’ll have more time to model! Get it together Kimmy! Pregnancy is one of the most beautiful and unbelievable miracles known to man kind! Maybe it’s time you stop wearing clothes that make you look like either a sofa and Shamu the whale. Quit being all self-conscious and embrace it. Usually when people get pregnant, they get fat. But regular pregnant women dress like normal human beings! Check yourself girl. 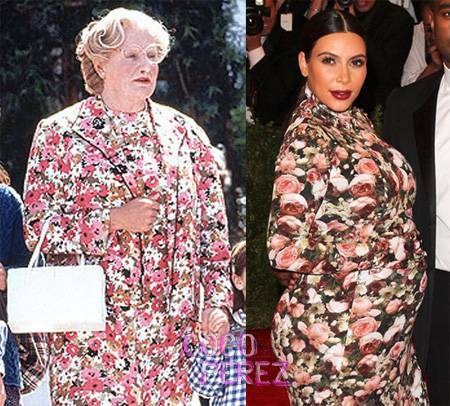 Mrs. Doubtfire for the win. I’m so glad your hair colour matches your dumb idea to get back with Chris Brown (sorry to all my blonde friends). Oh, you woke up with a new weave? That’s not all you’ll be waking up with girl. Bruises on bruises. It makes zero sense to me why she would ever go back with him…but who am I to judge?! It’s not like you’re a role model to young girls or anything…awkwaaaard!